· ½ tsp. Turmeric pwd. Clean the dry pohe & quickly wash the pohe & drain using a colander or through a big strainer & keep aside. Heat oil in a wok on med. heat. When the oil is hot reduce heat & add green chillies, mustard seeds, cumin seeds, turmeric pwd., curry leaves, a pinch of hing & stir. Now add chopped onions & cook till translucent. Then add chopped tomatoes & cook till it softens completely. Add sugar & the pohe & stir quickly on med. heat. Add salt to taste & a tablespoon of coriander leaves & stir till it cooks for about 5 mins. Keep stirring from time to time. In case it is dry then sprinkle water sparingly just to moisten a little. Squeeze fresh lime juice & give a nice stir. Serve hot garnished with grated coconut & coriander leaves. 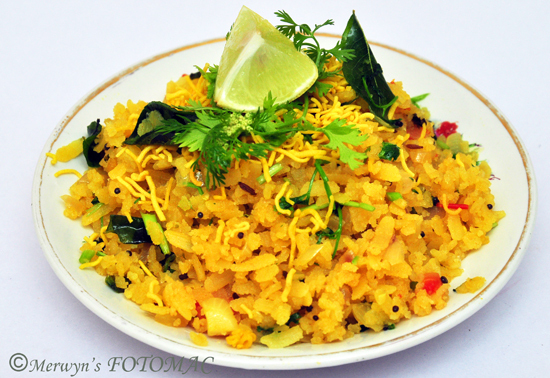 Alternatively, you can serve grated coconut, finely chopped onions, lime wedges separately. · Boil & peel potatoes. Dice them as you wish & add to the wok before adding the pohe. · Peel raw potatoes, dice them as desired & rinse them in water to remove excess starch & drain completely. Add the potatoes before adding the onions. While frying the potatoes in the wok add a little salt so the potatoes will cook & soften quickly. · You can add unsalted peanuts or green peas if you so desire. Add it before adding the onions so that it gets sufficient time to cook. · According to spice tolerance, use green chillies…Some green chillies; the dark green variety are very hot & some are very mild. Discard seeds if you are light on spice. · If desired; blanch tomatoes, peel, cut in half, discard seeds & then chop or slice finely.